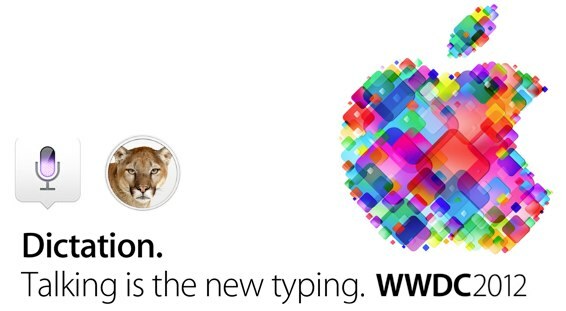 This week (11th to 15th June, 2012) Apple are holding their yearly World Wide Developers Conference (aka WWDC) at Moscone West in San Francisco, California. I am always fascinated by this event, it teases so much info yet at the same time manages to conceal from the world the intricate detail in those teases. Opening WWDC 2012 was Apple’s CEO Tim Cook who announced a whole raft of new hardware and software to get any Apple user just a little excited. The keynote is the only event at WWDC where journalists can attend, the rest of the week is dedicated to the developers where they get the inside scoop on Apples plans for their iOS and Mac OS X operating systems. Attendance is governed by the developers signing a Non Disclosure Agreement or NDA – leaving them in what I am sure is a bursting to tell someone quandary. Anyway, onto the subject of this post Dictation. During the opening keynote Apple announced that a new version of the Mac operating system OS X would be available in July 2012 taking it to version 10.8 and continuing the feline tradition called Mountain Lion. Mountain Lion comes jam packed with new goodies and features but the one that caught my eye was Dictation.